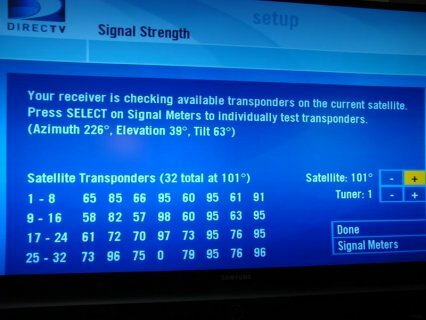 How do you troubleshoot this DIRECTV error: Searching for satellite signal 771? Bad weather has broken up your signal and programming has temporarily been interrupted. If there is heavy cloud cover or enough rainfall, a satellite signal can be diminished to the point where no signal will pass through the cloud cover or the rain and you have Interruption of your signal at the Satellite Dish which will cause an error code to appear on the screen of your television set. Bad weather should be the only circumstance under which this happens and it should happen rarely, not frequently. If it's happening anytime a Cloud passes by or the wind blows then your satellite dish is out of alignment and you would need to have a satellite technician come out to realign the Satellite Dish using a drill tools and computer. Your signal has been interrupted but it is completely clear outside. This can be caused by your wiring having damage to it such as an animal chewing it underneath your house or in your attic, basically somewhere in between the satellite dish and the receiver. If your programming is interrupted and it's clear outside then you probably need to call in a service call because your wiring may need to be repaired or replaced. In early model receivers and first generation Genie systems the power inserter unplugged will cause this error message to appear on screen. In the room where your power inserter is located look behind the TV to make sure that it is still plugged in. If it is plugged in and you have the error message 771 on screen then it is not a power inserter issue. Incidentally the power inserter is a rectangular black box with two ports on it and one green light. If you find it and it is plugged in but the green light is not lit up, your power inserter may need to be replaced or there may be a short in one of the wires that go to the two ports on the power inserter itself. One last thing is that if you have a multi receiver setup and you are receiving the error message 771 on screen and that error message is only occurring in one room instead of all of the rooms there is a good possibility that it is a wiring, power cord, or a receiver problem from that one particular room and the rest of the system is ok. Try troubleshooting the system by resetting the receiver with the error message on screen and if the problem reoccurs after the receiver loads back up it may be time to call in a service call with a professional technician.